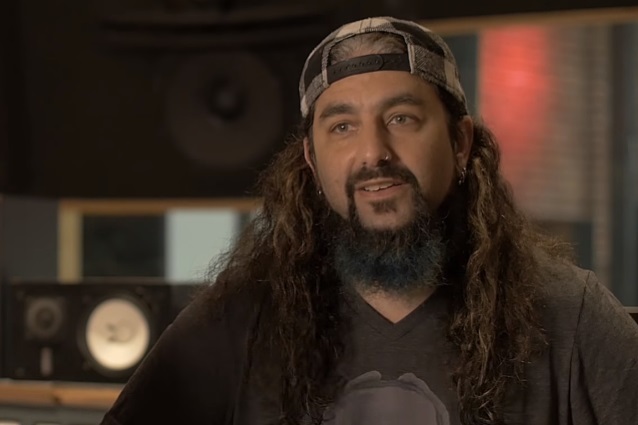 Mike Portnoy says that it would be "amazing" if he got an opportunity to collaborate with any member of RUSH. RUSH guitarist Alex Lifeson recently said that his band has no plans to tour or record again in the future. His comments came two years after chronic tendinitis-suffering drummer Neil Peart described himself as "retired" following the completion of RUSH's North American tour. Asked by Andy Burns of Biff Bam Pop! if he has had any contact with any member of RUSH about playing music together at any point in the future, the former DREAM THEATER drummer said: "I don't think they ever will [play together as RUSH without all three of them]; I honestly don't think they will. I think RUSH will only ever be the three of them. "Look, I get asked this a lot, and I, of course, would work with any of them in any capacity should they ever want to," he continued. "And yeah, it would be an amazing thing. I've never collaborated with any of them. "Neil and I have become very good friends through the years; that's a relationship that I'm so grateful for," he said. "And I've also gotten to know Alex really well. So, yeah, god, I mean, yeah, that would be amazing. I've collaborated with so many people, but I hadn't with any of those guys, so that would be amazing. But I wouldn't hold [my] breath — honestly, I really wouldn't. But they know where to find me." RUSH frontman Geddy Lee said in a 2016 interview that he had "accepted" that the band's last batch of live shows was "probably the last one as a tour." Lifeson and Lee confirmed that RUSH will never do a show unless all three musicians agree to take part. Portnoy previously told "The Chainsaw Symphony" radio show that he understood why Lifeson, Peart and Lee would want to call it quits while they were still at the peak of their playing ability. "I grew up with [RUSH] and I went through a huge RUSH phase in the mid-'80s, early '80s when I was a teenager," he said. "Neil was always my hero back then, and since then I'm honored that we've become good friends and I cherish that relationship. And I've stayed a RUSH fan through all these years. "It's sad to see it end, but you've gotta respect that, because if they can't deliver, and if they are in physical pain and they can't deliver what fans wanna see, I respect that they would go out on top," Mike said. "I don't like when I see bands that are just a memory of what they used to be, and there's a few out there that I've seen recently that are still touring… I'm not gonna name them, but some of the members can barely play their parts, and then they have a lot of other members that weren't even originally in the band. So I don't know. I would rather see a band like RUSH go out on top and have all the good memories of what they're capable of."